I honestly thought we were done with movies for January. There was nothing on the books I wanted to see - that includes Green Book. But then the Oscar nominations came out, and those movies that were out of - or about to be out of - the theaters that got a nod, got another life. Bohemian Rhapsody went from two theaters with one showing, to multiple theaters with multiple showings per day. And BlacKkKlansman came back, period. I had regrettably missed it the first time around, but not this one. We jumped at the chance. Us and 4 others. Until the movie started it was just 710 and myself. Then two couples came in - one to occupy the seats RIGHT behind us where the guy continually kicked my seat. Really??? First off - if you have the chance to see this movie still, do it. I'm not a huge Spike Lee fan, but there are no missteps here on his part, or any of the actors. BlacKkKlansman isn't easy to watch. There is such hate from the white population. It's uncomfortable, and it should be. Then there was the discomfort of 'are they going to get caught doing what they're doing'? You feel the pain of the black population of that time, including for Washington's character who is straddling the need for change in the black one, while working in the white world of which the former group is suspicious at best. Still, the hate and the language which falls off these actor's tongues seemingly so easily, when you know it couldn't have - or hoped it didn't. And we discussed after wards, that being Jewish or black in that movie had to be incredibly difficult even knowing it was film. These times were really not that long ago, and not only have they not changed much, we are backsliding..............and fast. I thought Driver did a really good job - and it wasn't his normal ranting and yelling he always does. I stand corrected on that front. Washington as great. And you know, Topher Grace was very solid as David Duke. While during the movie, you're 94.3% sure that Lee isn't just talking about 1971. There is even a reference of regarding Duke - and how no one would ever elect someone like him to office, which clearly about BLOTUS. The epilogue makes no doubts about how the problem has not gone but escalated. It's tough to watch and I found myself getting very emotional at that part. I get why it's up for best picture and director. I get why Driver is up for best supporting role, but don't get why Washington isn't up for best lead. 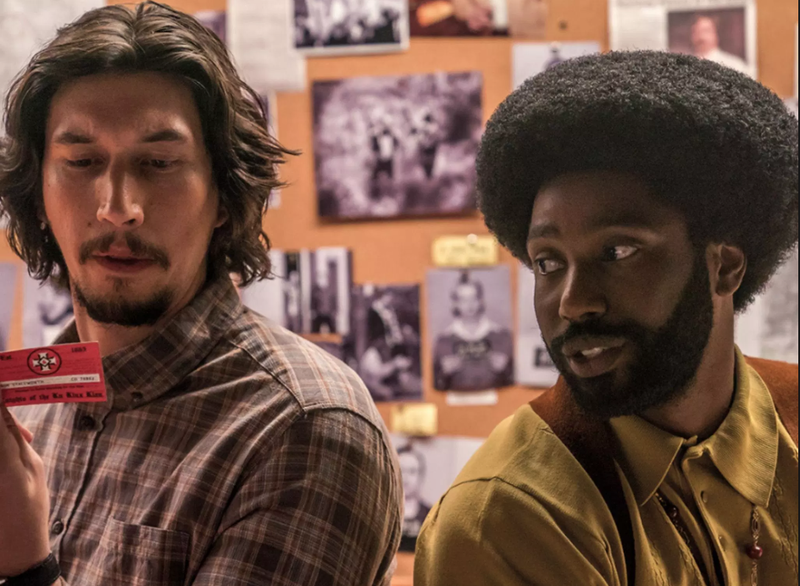 Had I seen BlacKkKlansman in 2018, it might have been the best movie of the year for me. That ain't nothin'. Maybe some other art-house things will appear. If not, perhaps the Cleveland International Film Festival. Either way, we've got a good jump on the 2019 goal - and I feel more confident in beating Mike in our annual Oscar fest.